The little white dress, lace, tuxedo jackets, sportswear and floral prints are just a few of the most popular trends for Spring and Summer 2012. Purists will also know that spring/summer 2012 is offering up white as the new black. Usually a major no, white has come in interesting guises for the new season. Along with white, the trendiest colors for spring and summer include tangerine, green, lemon, red, pastel light blue and black and white paired together. Even though white may prove a difficult trend to pull off, sport this season’s pastels with bravado, and opt for white pieces with an offhand air about them. Mix texture and layering; opt for a sculptural jacket with interesting lapel detail or, a perforated shift dress for girlish charm with a twist. 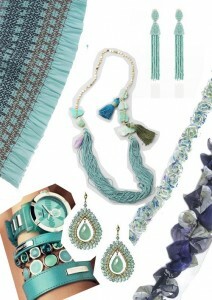 Multicultural looks inspired by Spain, Haiti, India, and Africa are making statements for this spring and summer lines. Patterns that are big hits include flowers, tropical, leaves, birds, animal and photo prints. Sportswear, including anoraks, track pants, motorcycle jackets and mesh cover-ups are the big winners in the spring/summer lines of the major fashion houses. Other popular apparel trends to look for are pleats, a variety of skirt lengths and pant widths, long evening dresses with sweaters or jackets, feathers, and ocean themes. When it comes to accessories, trends for spring and summer include wedge shoes, handbags that match outfits, pearls and vintage-style earrings.